Any condition where less than perfect surface contact is made between the underside of the machine’s feet and the surface of the base plate, or frame, is called soft foot. Soft foot is similar to being seated at a wobbling table. The table wobbles because at least one leg does not come in perfect contact with the floor. For a table, this is considered an inconvenience; with industrial equipment, this condition will result in misalignment and equipment damage. Soft foot is a commonly misunderstood term and a topic that can be considered on its own, separate from alignment. The effects of soft foot can be so prevalent in the alignment process, however, that it must be eliminated before making any alignment corrections. Pre-alignment checks and procedures include eliminating soft foot; however, soft foot should be checked in each stage of the alignment process. Parallel Soft Foot – Parallel soft foot exists when the foot simply does not reach the base and creates a gap between the foot and base. The bottom of the foot is parallel to the base plate. Tightening the hold-down bolts will result in a distortion of the machine’s frame as the soft foot is drawn down to the base. This condition is easiest to detect using either a feeler gauge or dial indicator. Angular Soft Foot – Angular soft foot can occur when the foot is touching the base on either the outside or inside portion of the foot, but the other side of the foot is bent away creating an angle between the base and the bottom of the foot. 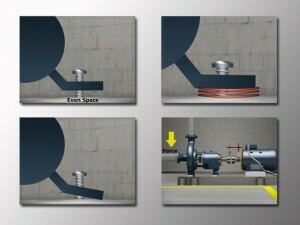 In both cases, tightening the hold-down bolts will result in a distortion of the machine’s frame as the foot is drawn down to the base. Squishy Foot – Squishy foot, sometimes called spring foot, exists when the gap between the foot and base has already been filled with shims. The machine will appear to be fixed of soft foot problems until the hold-down bolts are tightened. Tightening the hold-down bolts can compress shims that are creased, bent, or otherwise damaged. This condition can distort the machine’s frame as the foot is drawn down to the base. Stress-Induced Soft Foot – Perhaps the most difficult soft foot condition to detect is caused by forces that are external to the machine. This is referred to as stress-induced soft foot. It can be the result of pipe strain or stresses induced by the electrical connections as well as drastic misalignment. Stress-induced forces can be created during any stage of the alignment process; therefore, eliminating this kind of soft foot may require more than one check. Shaft Movement – The primary concern of uncorrected soft foot is that once the machine is tightened down, the centerline of the shaft will have moved. This can cause significant trouble when completing an alignment procedure and lead to premature coupling, bearing, and mechanical seal failure. Frame Distortion – Frame distortion can be caused by uncorrected soft foot. This condition exists when the soft foot is forced to mate with the base. With lighter framed motors, frame distortion can bend the motor housing. On larger motors, frame distortion can lead to premature failure of components, such as bearings. Internal Misalignment – Internal components can be forced out of alignment due to the forces and frame distortions caused by an uncorrected soft foot. These misalignments can cause decreased efficiency and early component failures. Distorted Bearing Housing – Machine frame distortion can distort the bearing housing. This can result in excessive wear on the top and bottom of the outer race and lead to premature failure. Fretting Corrosion – Vibration can loosen the bolts holding a motor to its foundation. A motor with a soft foot is more likely to cause fretting corrosion and repetitive impact damage to its foundation and bolts. This corrosion will, in turn, worsen the soft foot condition. To have smooth-running machines, soft foot must be detected and eliminated on both the driving and driven machines before performing the alignment. Rough-in – Once the machines are in their approximate final positions, a rough-in soft foot can be performed. It has been found that a rough-in soft foot check can eliminate as much as 90% of the soft foot present in a machine. Using Shims – Many times, it is easiest to use a shim as a feeler gauge in eliminating the residual soft foot. Simply slide the shim into position under the foot until it stops. Do not force the shim into place as this will raise the foot and can create soft foot on other feet. The purpose of the rough-in soft foot is to eliminate any gap under the foot. Once the gaps are eliminated and the other pre-alignment checks are complete, the technician is ready to move on to the adjustment stage of the alignment. Re-Check – After all of the adjustments have been made to the machines, check for soft foot a second time to be certain that no stresses or residual forces have been introduced. If soft foot is found, restart the procedure. Complete the Rough-In – Once the alignment has been checked in the adjustment stage, all of the hold down bolts should be tightened to the proper torque specification. The rough-in soft foot is now complete. During the precision phase, each foot is individually checked for soft foot before making any corrections. A dial indicator is used to ensure the most precise measurement possible. Adjusting one foot at a time will eventually be successful in removing the soft foot, but taking a few minutes to examine the soft foot on the entire machine can save hours of tedious corrections. In some cases, eliminating the largest soft foot will actually remove the soft foot at the other feet. Although eliminating all of the soft foot is the goal, sometimes difficult problems or time restrictions are encountered. If the base, feet, or legs of the machine are too flexible, for example, final adjustments may cause more frustration than results. A certain amount of tolerance is typically allowed and will vary by the machine or local guidelines. However, when the measurements have been taken properly using a solid base, it should be possible to limit the soft foot to within 1 mil, or 0.001 inches. To learn more about implementing maintenance and training programs to teach personnel about proper detection and correction of soft foot, as well as other industry-related issues, please contact us at (813)908-1100.